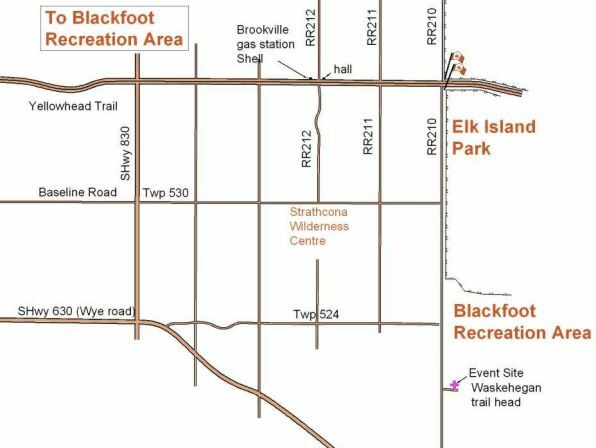 Easiest route is east along the Yellowhead Hwy to the Elk Island National Park flag pole and a sign to Cooking Lake/ Blackfoot Provincial Recreation Area, then south down RR 210 for about 7km. Turn left into the Cooking Lake / Blackfoot Provincial Recreation Area, Waskahegan Staging Area parking lot. Registration will probably be in the shelter on the east side of the parking lot. Or east along Baseline Road (becomes Twp 530) to the T junction with RR210. Turn right and go south for about 4km. Turn into the Cooking Lake / Blackfoot Provincial Recreation Area, Waskahegan Staging Area parking lot. Registration will probably be in the shelter on the east side of the parking lot. Or east along Wye Road. Just after the road bends to the southeast, turn left onto Twp 524, crossing the railroad tracks. Continue east to the T junction with RR210. Turn right and drive south for just over 1km. Turn into the Cooking Lake / Blackfoot Provincial Recreation Area, Waskahegan Staging Area parking lot. Registration will probably be in the shelter on the east side of the parking lot. The Brookville gas station is no longer Shell, and has no amenities other than gas pumps. Brookville Hall has a distinctive steep-pitched roof. If you want to Google the location, type in Waskahegan Staging Area.